Vintage Leaf Memories - Michael Langlois: Could Reimer go the other way for Luongo? Could Reimer go the other way for Luongo? If you follow VLM at all you know that I have very little interest in rumours. By that I mean I don’t try to start them—there’s plenty of that happening elsewhere, and in many cases by reporters who have legitimate connections to NHL people who help start a lot of the speculation that gets cranked up. Also, I don't report on rumours or focus on them here. But as we wait for (as I posted yesterday) that first Maple Leaf “shoe” to drop this summer—in terms of serious roster movement—I’ve been wanting to write about an olden-days summertime trade that really rocked the hockey world, but current Leaf intrigue keeps nudging me to write about what might happen this week, as opposed to something that happened 50 years ago. However, that "yesteryear" trade involved two of the best goalies of all-time, when they were still in their prime (I’ve no doubt written about that deal before, but hey, I’m getting older and I repeat myself a lot…) so I don't want to neglect a great old personal memory. But before I get to that story, I do wonder what is going on right now in any Leaf-Vancouver negotiations about the much-discussed Roberto Luongo. It’s obvious teams that want Luongo are acting like they're doing Vancouver a favour by being willing to take his large salary off Gillis' hands, while offering only bad contracts in return. Meanwhile, the Vancouver GM himself wants actual useful (preferably young, I’m guessing) assets in return. In short, he wants a hockey trade, while his competitors, including Burke, are offering cap dumps. If Toronto is in the mix, we’ll see who blinks first. I’m just wondering if Gillis has asked for Reimer, a Western kid who is still under contract at a “reasonable” annual amount. Why do I mention Reimer? Well, he could serve as a back-up to Schneider while he regains his confidence without the pressure of fighting to be a number-one again in the Toronto spotlight. In any event, whoever might go the other way, getting Luongo would be a huge deal for the Leafs. It’s not a move that I support, but many Leaf backers would dearly love to see it happen, because they feel Luongo would be an instant upgrade and would, at minimum, get the Leafs to the playoffs in the somewhat weak Eastern Conference. But I’m not sure any deal (to any team) for the tall veteran netminder would shake the hockey world quite like the one that occurred in the summer of 1963. 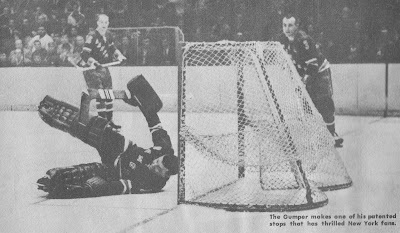 That off-season, the then ever-struggling New York Rangers sent Gump Worsley, a short, round but ultra-talented goaltender, to the Montreal Canadiens for many-time Vezina Trophy winner (and end-of-season All-Star), Jacques Plante. Both teams wanted to shake things up. The Rangers likely looked at Worsley as a guy who, yes, faced a lot of rubber behind a bad defensive team, stopped tons of shots, but also a goalie who wasn't winning enough games for them. 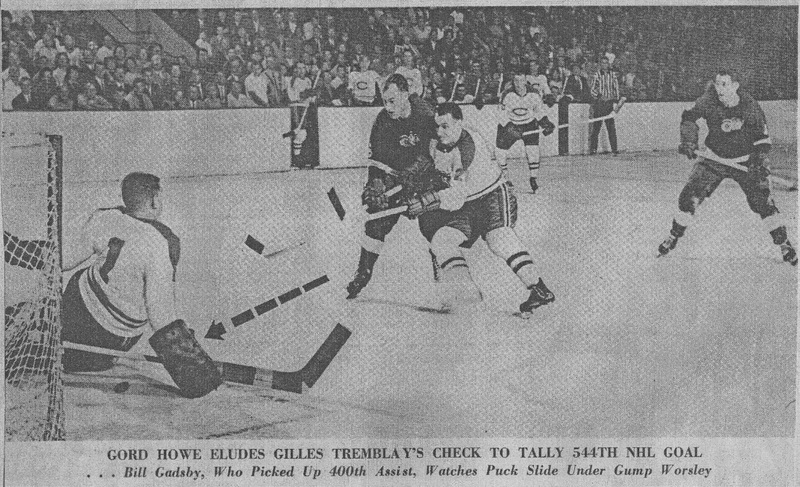 (I've included a great old picture above of Gordie Howe scoring his NHL record-tying 544th regular-season goal against Worsley in Detroit, early on in Worsley's first season with the Habs. 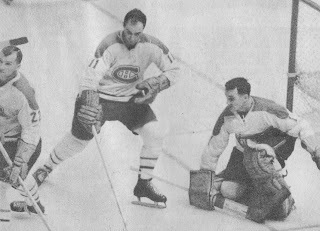 Rocket Richard held the all-time record for career goals until Howe passed him. A quick side note- Worsley also gave up Howe's 500th and 600th regular-season NHL goals.) The Habs had come off three years in a row without a Cup, which, in those days, was hockey misery of massive proportions in hockey-mad Quebec. The Rangers had only made the playoffs once in the previous half dozen or so years, and were looking to re-make the roster somewhat. 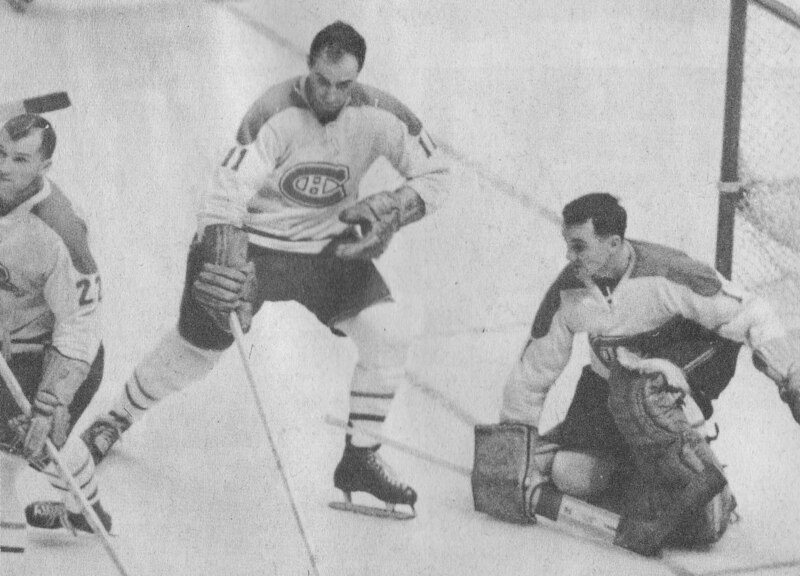 The major pieces in the deal were indeed the two goalies, Plante and Worsley (seen at right in action with the Rangers at the old Madison Square Garden- that's Hall-of-Famer Harry Howell on the right), but the Rangers also acquired some skill in young forwards Donnie Marshall and Phil Goyette, while the Habs picked up a tough winger in Dave Balon and the similarly feisty Leon Rochefort. Everyone involved in the deal were good players, but the real story was the swapping of the two goalies who were both on their way to the Hall-of Fame. Ironically, both struggled at first after the trade. Worsley spent time in the minors while Charlie Hodge assumed the number-one mantle in Montreal for part of two seasons, while Plante started OK on Broadway but eventually ended up in the minors as well (Baltimore in the AHL, I believe) before retiring. Plante had kind of worn out his welcome in Montreal. He was a sensitive soul, and a very proud and intelligent individual, by all accounts. Coach Toe Blake felt he couldn't count on Plante (left- that's Donnie Marshall on the far left of the picture) because of his mood swings and health issues. At first, Jacques welcomed the trade as a fresh start but he never really settled in well in New York. (After the big trade, he made some public comments that suggested the Rangers were a team on the rise, which they turned out to be, while the Habs were not. He was very wrong about that.) He left the game, seemingly for good, after two off and on seasons bouncing between New York and the minors. Worsley also needed time to find his form with the Habs, but he ultimately did, helping to backstop them to Stanley Cups in 1965 and ‘66, and also in 1968 ad 1969, before finishing his career with the Minnesota North Stars. 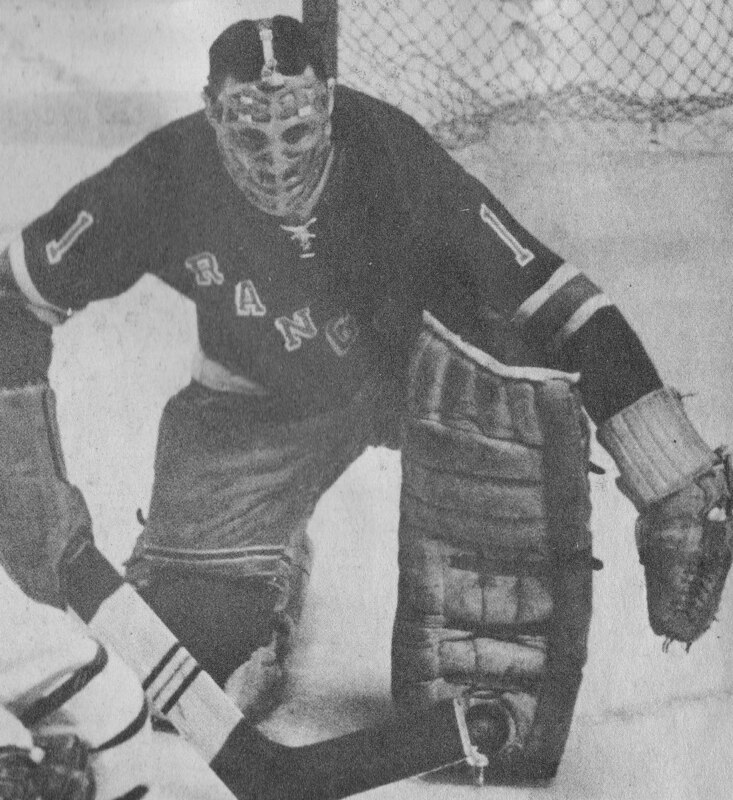 For his part, Plante (shown with the Rangers at right) made a truly remarkable comeback after being away from the game for several seasons. In fact, after three full seasons away from the ice, he signed with the expansion St. Louis Blues and was marvelous for them for two seasons, teaming with the great former Chicago ‘keeper Glenn Hall to lead to the Blues to the Cup finals in 1969 and ’70. Plante then was sold to and played for three seasons with the Leafs, and he was very, very good in his time here. Already in his 40s, he teamed with Bernie Parent for the last half of the 1970-’71 season with the Leafs and again in 1971-’72, both playoff seasons for the blue and white. They were a wonderful tandem—until the WHA lured Parent away. Plante went on to play briefly with the Bruins (Jim Gregory traded him for a first round pick which was very smart; I think that turned out to be the talented but rather enigmatic Ian Turnbull…) and then in the WHA when he was 46 years old, which was amazing. Both were incredibly successful goalkeepers. Plante was the refined, innovative, sensitive, “roaming” goalie who changed the game. He was the first guy to really leave the net, for example, and stop the puck behind the net for his defensemen. And we all know he “invented” the modern-era goalie mask, first wearing it in a game after being hit in the face by an Andy Bathgate slapshot in the fall of 1959. Worsley, on the other hand, was the non-athlete (at least by appearance), a slightly overweight, beer-drinking goalie who refused to wear a mask until his years in Minnesota, when he was already into his 40s. They were two generational players, truly great goalies—traded for one another in the summer of 1963. Will we ever see that kind of trade in the NHL again? Well, I suppose if Luongo was traded for Tim Thomas, it would be close…..but it still wouldn’t quite be the same. I'm not sure that I would do it. That would leave a tandem of Luongo and Scrivens in Toronto. Scrivens has better AHL numbers than Corey Schneider. Scrivens might chase Luongo out of Toronto just the way Schneider is chasing Luongo out of Vancouver....the stats say Scrivens could do it. I rather Tim Thomas come in. If Thomas needs time off...tell him he only is going to play about 40 games. Chris Mason might also be a viable one year insurance policy. He is UFA has 306 NHL games and has played well some years. He might prevent us from rushing Scrivens. "Toronto is also the likely new home of Roberto Luongo, but that deal likely won't happen at the draft. Why? Because there's no market for Luongo. The Canucks will hold on to the player as long as it takes to get a decent offer. The Leafs aren't going to offer squat for him, because why should they? They can afford to be patient and will completely soak Vancouver in a deal once the team gives up on the situation." So I think maybe Burke tries out Scrivens and Reimer to start the season while Vancouver holds out for a better offer? If the kids play well Burke does't offer more and we never see Luongo. If the kids falter after 20 or 30 games into the season, Burke offers more and we see Luongo in TO after Christmas. "Let me start by suggesting that Leafs GM Brian Burke already knows if Justin Schultz will be joining his team on July 1st. This is not to say Burke has tampered. It's not his fault Jake Gardiner and Schultz are friends, and they likely have discussed the possibility of playing together. Why is this relevant? If Burke knows Schultz is jumping on board, it opens up an opportunity to deal Luke Schenn, either as a way of improving Leafs draft position, or as part of a major deal to land a starting goalie or a 1st line center." Thus if we have Schultz, we might get tipped off if Burke deals defensive assets at the draft. If Burke drafts a big elite center, (Galchenyuk or Grigorenko) then signs Schultz and has Luongo in place after Christmas plus makes the playoffs then I think Burke gets another contract. Burke might pull it off. The stars are lining up. I think the only thing that worries me about bringing in Luongo to shore up the goaltending is that we probably have to choose between Scrivens and Reimer. I like both of these young guys character and either one could break out as a number one starter immediately after leaving the Leafs. For me though the reward is greater than the risk, we need a proven guy in that position, and if not Luongo, hopefully someone as equally dependable (Kipper?). I'll finish with one final thought on the Luongo speculation. I'm hearing a lot of 'Gillis is looking for a hockey trade, not a salary dump'. I always understood a 'hockey trade' to be one in which both teams benefit by getting what they need/want. In this case, I don't see anything wrong with salary going both ways. Gillis' need is to relieve himself of an excess starter that doesn't want to play for him and to get some value back in return. Dumping some salary would be the bonus that gets the deal done. Komisarek (or you pick it) + a mid-range prospect or late round pick seems fair value plus cap relief. A hockey deal and a salary dump do not have to be mutually exclusive. DP, I think the wait-until-later in the season for a Luongo deal could indeed happen, for many reasons, including what you mention above. Maybe Schultz is already "in the bag"- we'll see! The only thing I would kick in is, maybe we re-word the phrase to say, "old-time" hockey deal...when it was simply a matter (as I wrote about today re Worsley and Plante) a good old-fashioned player-for-player swap, not about contracts moving, etc. i love the worsley/plante story michael... i also enjoy DP's comments today... lotttts of speculation going on. i'm with you though mike, in that i'm not particularly interested in bringing luongo to the leafs. Trades (and speculation) may not be fun for the athletes involved, but from a fan perspective, it's a big part of what keeps interest up when there isn't much else going on for your team! Jacques Plante is my favourite goaltender of all time! And has there ever been any tandem better than Plante/Parent in the history of the game? As far as Luongo goes, Gillis can pine for the good old days of hockey trades, but ultimately he will have to come to terms with contemporary reality of multi-million dollar contracts and the salary cap system. I am certain he is bluffing about interest in Luongo. If he wants to get out of an untenable situation he will have to take back salary for a couple of years at least. The Leafs would have to take on a lot of salary in Luongo and a certain amount of risk as well. I have already written here about the Veteran Goaltender Myth. Perhaps Plante and Parent could have coped with Ron Wilson’s run and gun and bizarre goaltending management, but few in the history of the game could. To imagine that a middling veteran could have done better under those circumstances makes for the stuff of fiction, but ultimately personnel decisions have to be made in the cold hard light of reality, not in some stats junkies’ fantasy league. Reimer/Scrivens is perfectly acceptable to me, given the current market conditions, and I believe that Leafs management may be thinking along similar lines. Consequently, Nonis and Burke may well yet take pleasure in rubbing Gillis’ face in it, while spiriting Luongo away. As for Reimer, I see Winnipeg as a more plausible destination, with a valuable asset(s) coming back the other way. I feel sorry for Reimer however, not because he would have to buy so many tickets for friends and family, but for a decent, kind hearted man to have to wear that adolescent jersey with the militaristic logo. It would be difficult to identify goaltenders who would have thrived behind last year's team, for sure, Bobby C.. There may well have been guys that would have played better than Reimer or Gus, but we've talked about how Leaf goalies have been handled in recent years, so I won't raise that whole issue again. I'm a Reimer guy (I acknowledge I'm a fan of how he handles himself in a tough market), and would prefer he stay with the Leafs. I could see him with the Jets some day, though not necessarily now, of course. Your consistent stand on the Luongo question is very much in play as we speak this week! "We are prepared to go forward on that basis," Burke said. "If we can upgrade at the goaltending position, and at a reasonable price, we’ll do it. But we are prepared [to go with Reimer-Scrivens]. I believe in James Reimer. He’s young, he’s athletic, I believe in this kid. If we have to start like that, we will." Burke declined to talk about specific goalie targets, but it’s clear through conversations I’ve had with other league sources that the Leafs have interest in Luongo, although as of Wednesday morning, I don’t believe there had been any meaningful discussions between Toronto and Vancouver. I don’t think the Leafs would be willing to move a high-level asset to Vancouver in exchange. My sense is that Toronto will keep tabs on the Luongo situation, but is not in desperation mode whatsoever to get something done. Not with 10 years left on Luongo’s contract. If it’s a deal that make sense, I think the Leafs will do it. But they won’t overpay. Great story, Michael. Thanks for sharing it.